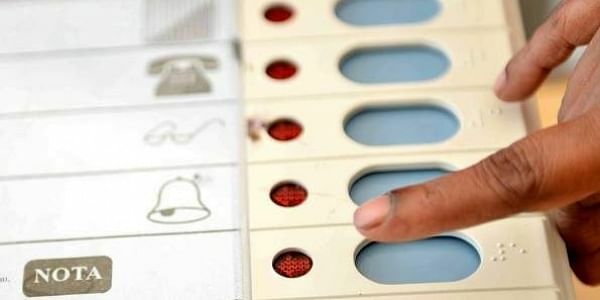 The Aam Aadmi Party referred to a news report on the alleged link of a Gujarat State Petroleum Corporation Ltd scam to a foreign company making microchips for Electronic Voting Machines abroad. LUCKNOW: Even as various exit polls predicted BJP victory in the Gujarat assembly elections, the AAP on Friday questioned these but said if results on December 18 indeed tallied with the predictions the BJP must have manipulated the EVMs. "There were massive crowds at rallies of Patidar leader Hardik Patel. BJP workers were booed at many rallies. Prime Minister Narendra Modi's public rallies were thinly attended. Still, if the Bharatiya Janata Party wins, it has managed to manipulate the EVMs," Aam Aadmi Party (AAP) Spokesperson Sanjay Singh told the media here. He also referred to a news report on the alleged link of a Gujarat State Petroleum Corporation Ltd scam to a foreign company making microchips for Electronic Voting Machines abroad. Sanjay Singh slammed the Yogi Adityanath government and said there was chaos and lawlessness in the state and that sectors like power, law and order, education, and health, were in tatters. "A cancer patient was gang-raped in the heart of the city. Six-year-olds are being raped. Policemen are beaten up by BJP cadres and officials are arm-twisted by the ruling party workers," the AAP leader alleged. He said the BJP had lost popular support as depicted by the civic body elections, wherein of the 12,000 municipal seats, independents won over 8,000. Singh claimed that the AAP was fast emerging as an alternative in Uttar Pradesh, as was evident by its decent showing in urban body polls. The AAP leader talked of how the Arvind Kejriwal government in Delhi had adopted a public-oriented approach in policy-making. "Mohalla Clinics, schools for all, and cancellation of Max hospital's licence shows that for us (AAP government) public interests and welfare are at the core of our model of governance," he said. The AAP leader criticised Modi and Chief Minister Yogi Adityanath for what he called "misleading" anganwadi workers and Shiksha Mitras in the state with false promises.